We are proud to inform our followers that as Agoras Exhibitions we are starting to organize our new exhibition; RENSEF Renewable Energy Systems and Energy Efficiency Exhibition, in Turkey , Antalya. 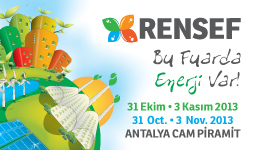 RENSEF is organized with the aim of introducing Tourism and Agriculture Investors of the region with National and International players of Renewable Energy Systems and Energy Efficiency Industries in Antalya. Antalya, Tourism facilities are in the beginning regarding the energy efficiencyissues. Energy expenses in tourism facilities are driving investors to search of how to reduce the energy bills and to alternative energy forms. What kind of business isWind Energy, will it grapple here? Can the investors of this area invest in wind energy? Afyon is geographically very close to Antalya. Can tourism and agriculture investors invest inGeothermal Energyfor energy needs? One of the most important questions, how can an investment like this financed? When will the return of the investment occur? Who are the suppliers? Who can we start out with? Under this perspective we would like to invite you to follow us from our web site www.rensef.org that is published both in English and in Turkish. These days we are continuing our preparations. Very soon we will inform you for the 2nd Solar Symposium that will be organized by the Chamber of Architects and Chamber of Electrical Engineers Antalya Branches parallel to the exhibition. More over very soon we will inform you about the other planned activities in the fields of Biomass, Biogas and Energy Efficiency. We would like to invite all the interested parties to join us, to reserve their space in the Floor Plan that will be opened to the public very soon. This Page Has been updated at 9.05.2013 and has been read 0 times.